This fall, Bull will be opening two new restaurants in Austin. Congress will be a fine dining, dinner-only restaurant, and Second at Congress will be a more casual spot with patio and terrace seating serving brunch, lunch, and dinner. Connecting the two will be Bar Congress serving appetizers and cocktails. Bull mentioned he’s working with farmers to determine how much of the menus can be sourced locally. You can also find Bull’s cuisine in an interactive format. 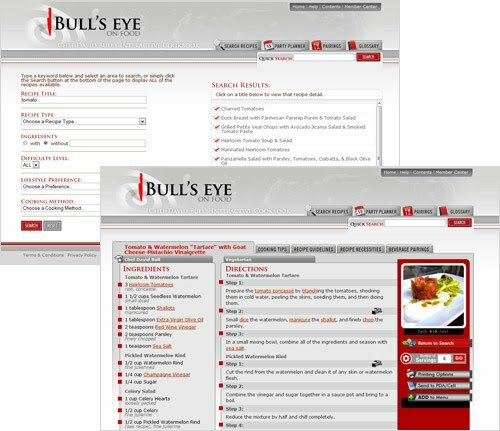 His online cookbook is called Bull’s Eye on Food, and you can search recipes by title, type, or ingredient. Once you choose a dish to prepare, you can enter the number of people you’ll be serving, and the quantities in the ingredient list will be re-calculated for that number. It will also generate shopping lists and even send the list to a smart phone. The other nice interactive feature of this book is that new recipes are added all the time. 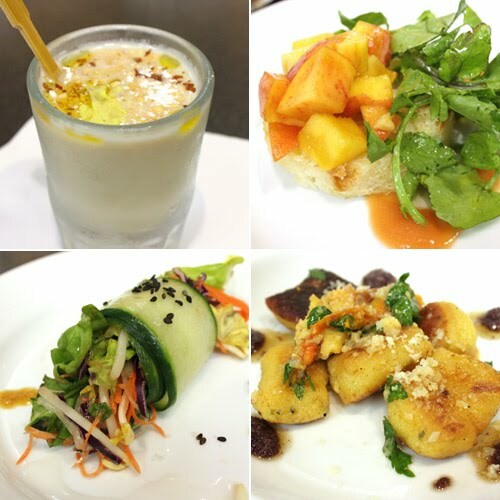 The vegetarian dishes prepared for the class were added just after being presented. I sampled and enjoyed all of the dishes from the class, although the wine pairings didn’t uncover any new favorites for me. The white gazpacho was surprisingly good because of how well-balanced it was. I expected something a bit on the sweet side, but instead it was crisp, cool, a little tangy, only slightly sweet, and was delightful with the almonds on top. The cucumber rolls were fresh, crunchy, and light. I considered making those with some added stick-like pieces of tofu. And, the watercress salad with peaches and buttered brioche with a peach puree and red wine vinegar sauce was outstanding. That would be a beautiful brunch dish. Last, I was thrilled to watch the gnocchi being prepared as I’ve lived in fear of attempting to make it myself for so long. I think I’m almost ready to try it now. 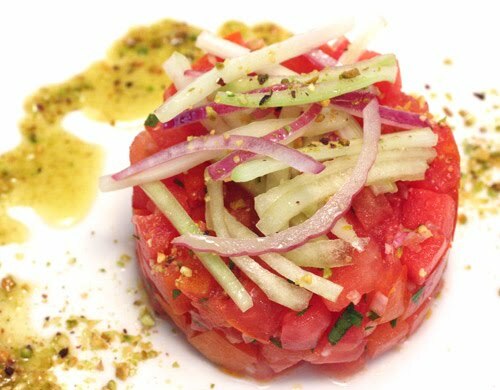 But, the dish I had to try right away to make at home was the tomato and watermelon "tartare." It was summery and brightly-flavored with hints of savoriness from shallots and red onion. The goat cheese dressing was delicious as was the pistachio vinaigrette, and when the two were swirled together with a bite of the tartare, it was excellent. While demonstrating this recipe, Bull explained that he was including chef’s techniques and that a home version could be simplified. I chose to make a simplification or two; I admit it. I didn’t bother preparing the tomato concasse. I left it unpeeled and just seeded it. I did make the watermelon rind pickles, but my julienne on them and on the celery pieces could have been thinner. I was happy with the ring-molded shape of the salad, and pressing excess liquid from the contents of the mold, as instructed, is necessary for it to hold together well. Then, it’s very pretty on the plate with a sprinkling of chopped pistachios and the dressings drizzled here and there. The complete, chef-version of the recipe is below. -prepare the tomatoes concasse by blanching them, shocking them in cold water, peeling the skins, seeding them, and then dicing them. -combine the vinegar and sugar in a sauce pan and bring to a boil. reduce mixture by half and chill completely. 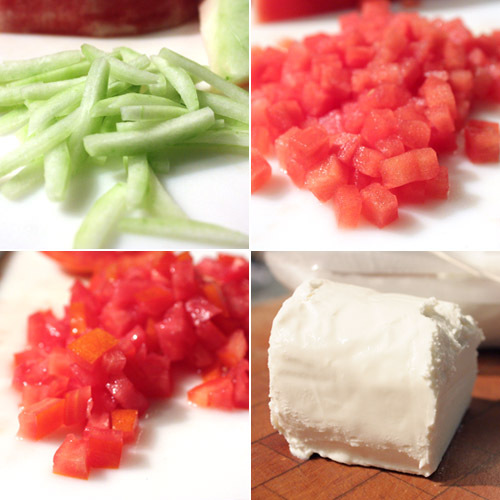 -pour the chilled mixture over the watermelon rind in a bowl and allow to sit for 20-30 minutes. -remove the rind and drain the liquid. reserve the rind for the celery salad. -in a small mixing bowl, combine all of the ingredients. -mix all ingredients together in a small mixing bowl until completely. should be the consistency of yogurt. -toast pistachios in a 350 degree F oven for about six minutes. remove from oven, season with salt, and grind them in a food processor until finely crumbled. reserve some ground pistachios for garnish. -mix the remaining pistachios with the rest of the ingredients in a small mixing bowl until completely combined. -place the tartare into ring molds and press with a clean kitchen towel (or paper towel) to release some of the juice. unmold the tartare onto plates. 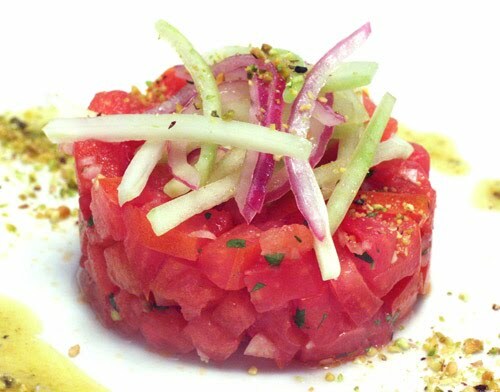 -top tartare with celery salad and toasted, ground pistachios. -drizzle the goat cheese dressing and pistachio vinaigrette around the plate and serve. this is a refined tartare! Fresh and scrumptious! Oh my, how delicious and very gourmet dish Lisa. Extremely elegant! I love it! wow, this recipe sounds amazing and so does the cooking class! Are you sure that isn't tuna? Gorgeous take on tartare! I love the combo! the combination of tomato and watermelon sounds really refreshing! The tomatoes and watermelon - 2 become 1 ! Gorgeously beautiful! That sounds like a fantastic tasting class! I would have wanted to try all of those dishes. This one is quite intriguing though, as I've never seen anything like it before. A little sweet, a little tart, a little tangy. Your taste buds must have been very happy! what fun! see, normal tartare is not for me--i get squeamish about such things. i would enjoy this dish very much, and i love its elegant presentation! Thanks for sharing this. Didn't get to attend but was very interested. Can't wait to try the pistachio vinaigrette. This looks delicious. I love little classes like this. You get some new ideas. A beautiful and elegant summer dish, Lisa! Marvelous combo of ingredients. What fun classes like this are. Your photos did the dishes justice, too. Going to check the online cookbook now. This presents so well, and looks like it would taste amazing. What a great class! I love this trompe d'oeil dish! So clever and beautiful looking. Wow! That looks fantastic! I don't like goat cheese, but I would love to try it using a different cheese. Erica: Any soft, crumbly cheese would work great. Or, you could make a dressing with sour cream or yogurt. Oh..how I wish I'd seen this post a few days ago when I had two seedless watermelons that weren't being eaten fast enough. I love pairing watermelon with goat cheese, and your tartare looks stunning..so stunning! The class sounds like it was a lot of fun! I love watermelon in salads. I especially love it in savory ways. I hope you spared at least one thought of me in your amazing class. How I would have loved to have been there with you! Wow, this just looks absolutely incredible, what a tasty and elegant starter. Lisa, you've inspired me with this deliciousness. 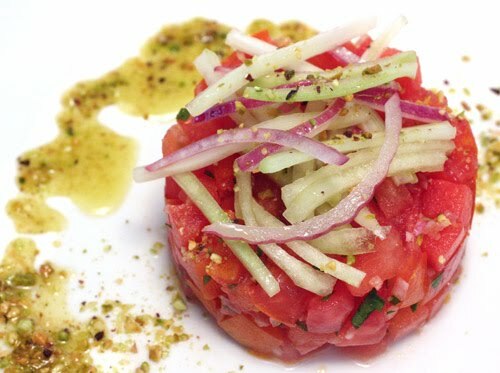 That sounds like a really fun class Lisa and I love your take on the tomato tartar... Great idea for a dish anyway! The tartare is so refreshing and elegant. Very refreshing! Tomatoes and watermelon are an interesting pair, but they work. The bright red hue is nice as well. You just have the thing to make summer look so pretty and juicy!! so very fresh and lovely.